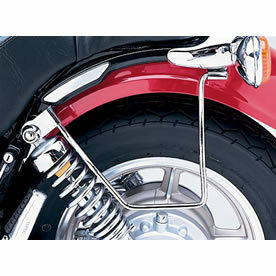 Yamaha Virago Saddlebag support bars are custom designed for the Virago. Saddlebag support bars help keep saddlebags off the fender, away from the rear tire and allow clearance for swingarm movement. Once you have the supports you can install either Yamaha or aftermarket bags. Sold as a pair for both left and right sides. Easy install, instructions included.